Our Physicians and staff are dedicated to advancing the treatment of conditions of the retina and vitreous including Age-Related Macular Degeneration (AMD), Diabetic Retinopathy, Retinal Vein and Artery Occlusions, Retinal Tears and Detachments, Macular Hole surgery, Macular pucker, Uveitis, Floaters and Flashes and complications from Cataract Surgery. Age-related macular degeneration (AMD) is a chronic condition that causes central vision loss. It affects millions of Americans. In fact, it is a leading cause of blindness in people 60 and older. The older you are, the greater your chance of being affected. That's why it's important to learn the symptoms of AMD now, so if you ever notice anything wrong, you can see an ophthalmologist right away. Early detection is key to avoiding vision loss. Retinal vein occlusion (or RVO) is a disease of the retina that affects approximately 180,000 people each year in the US. Veins in your eye—known as retinal veins—are an important part of your eye's normal circulation. They move blood out of your eye toward your heart. A retinal vein occlusion is the blockage of one of these veins. RVO can lead to swelling of the macula, the part of our eye responsible for central vision and fine detail. This swelling can cause blurry or distorted vision in the affected eye. In some cases, RVO can lead to permanent vision loss. 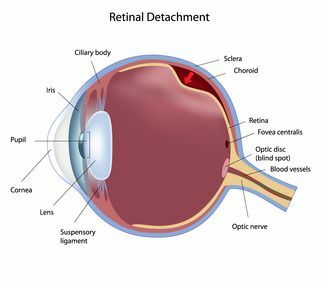 Retinal detachment is a serious, time-sensitive condition that must be treated as quickly as possible to preserve vision. Symptoms of retinal detachment include flashes, floaters, and a curtaining or shadowing effect across a patient's field of vision. If you are suffering from any of these conditions, contact Retina Associates, P.A. immediately. Our retinal specialists can help diagnose and treat your retinal detachment and help preserve your vision.